Hola! I hope all of your weeks have been going fabulously. 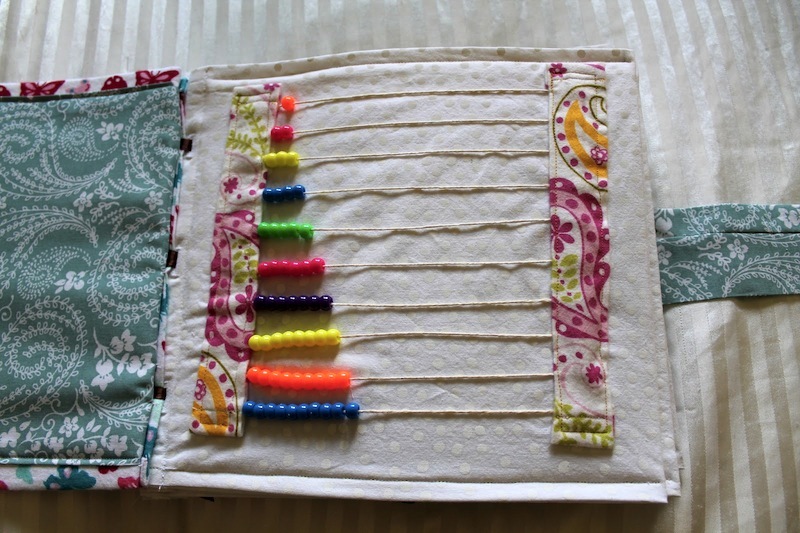 I have a great new quiet book to show you today, made by stay-at-home-mom Ashley. It's really cute and has some awesome learning pages - I really like the shapes/color page (I love the matching buttons!) and the counting cupcakes page. I also like the buckle that she put on the cover - such a smart way to make sure everything stays intact! So, enjoy! Ashley - I am a stay-at-home mom to two awesome kids and a happy wife to my husband of almost five years! 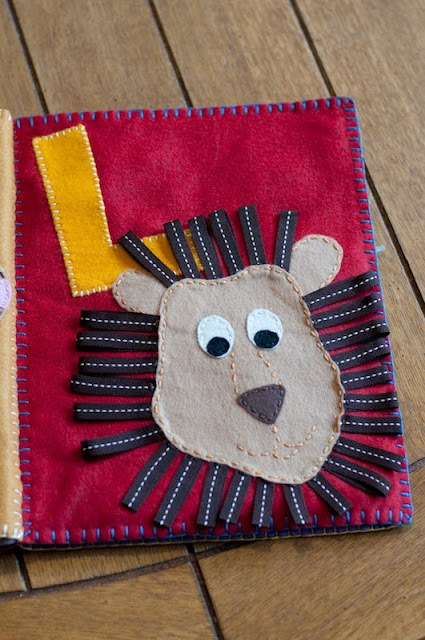 I made the quiet book for my kids, Lola (3 years) and Otto (18mos.). 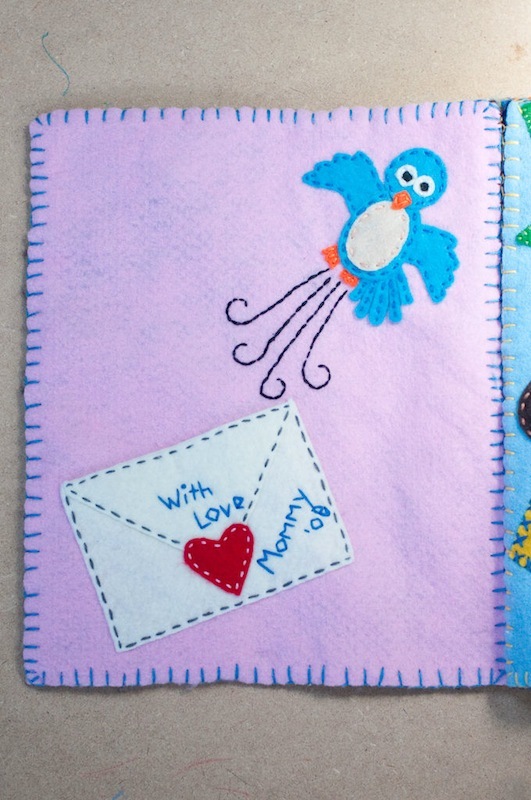 It is geared for Lola, but designed for both once my youngest is ready. No templates, just ideas of others' books I'd seen on the site. I used a large piece of fleece for the cover of the book. 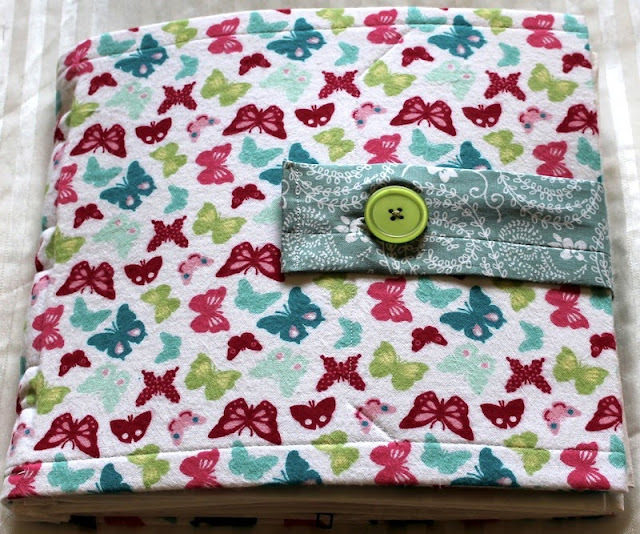 I sewed a small piece of the fleece down the center and put 3 rings to create a binder-type function. 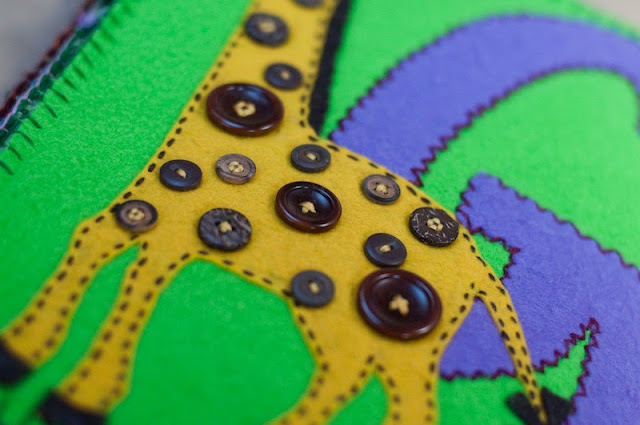 My husband added grommets to each page to reinforce the holes. The cover and each of the pages are made from fleece. Each page is decorated with colored felt, ribbons, and buttons. 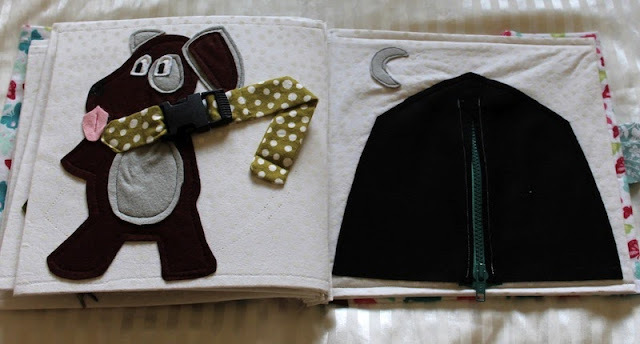 Heat-n-bond (had less than a yard on hand) and Pellon wonder-under under each piece of felt, cereal boxes and one piece of heavy cardboard for in between the pages, a zipper, a buckle, old baby clothes for the snaps page and overalls. I tried to use what I had on hand for each page, so my costs were minimal. I think I spent about $20, with the bulk of it being on the Pellon. My favorite page is the car/ map page. I love all the details of the places to visit (which are our favorite places too): Coffee shop, church, library, target, park. 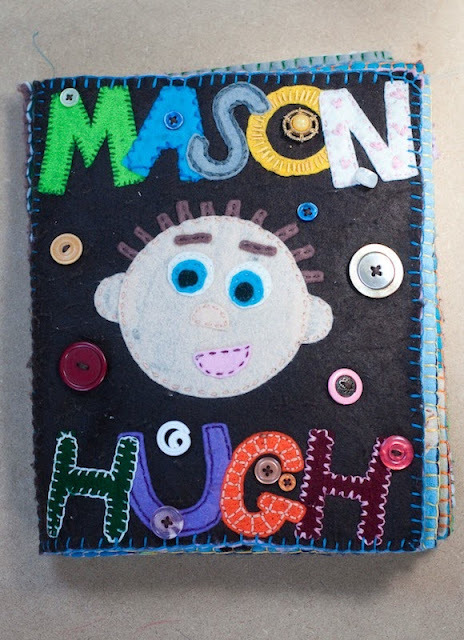 Thank you so much for sharing your awesome quiet book with us, Ashley! Hi everyone! 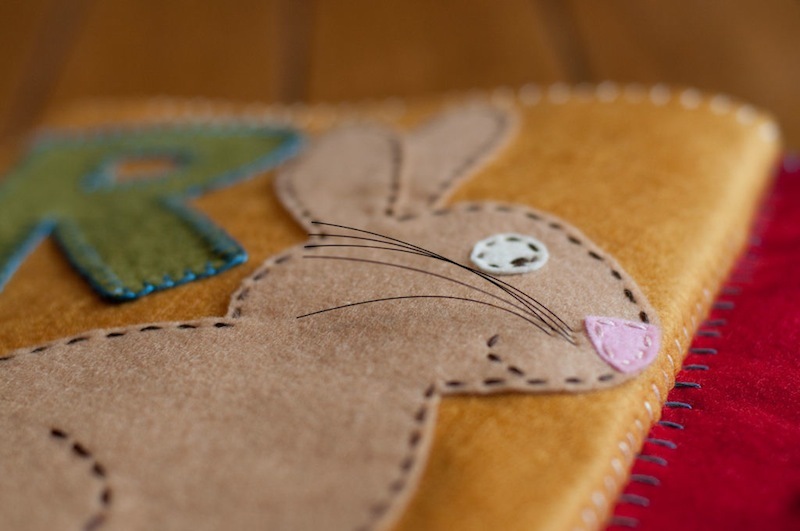 So, instead of a regular post featuring a quiet book today, I wanted to introduce you to a new page on the blog: the Quiet Book Pattern Directory. 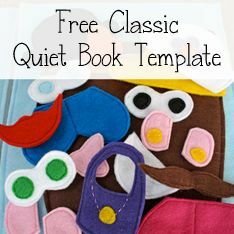 It's a page with a list of websites where you can find templates for full quiet books, and also places where you can find templates for individual quiet book pages. 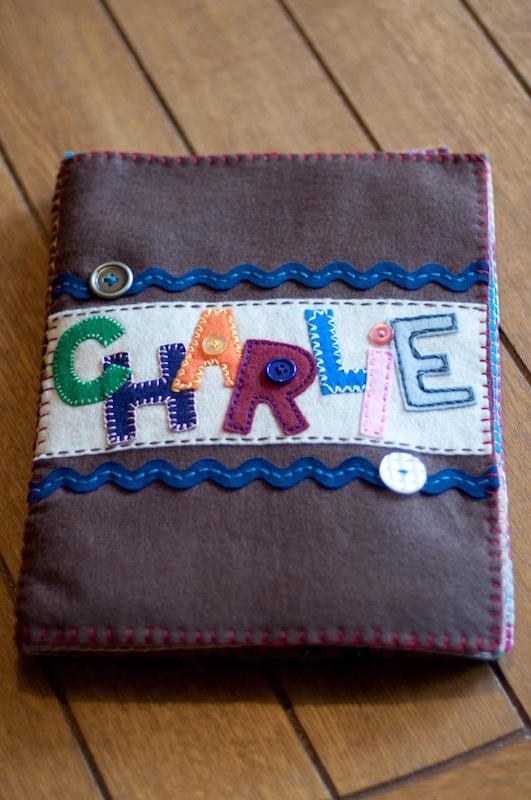 This page will continue to grow as I find more quiet book templates to share. If you know of any that I've missed, feel free to comment and I'll add the template to the list! Hi everyone! 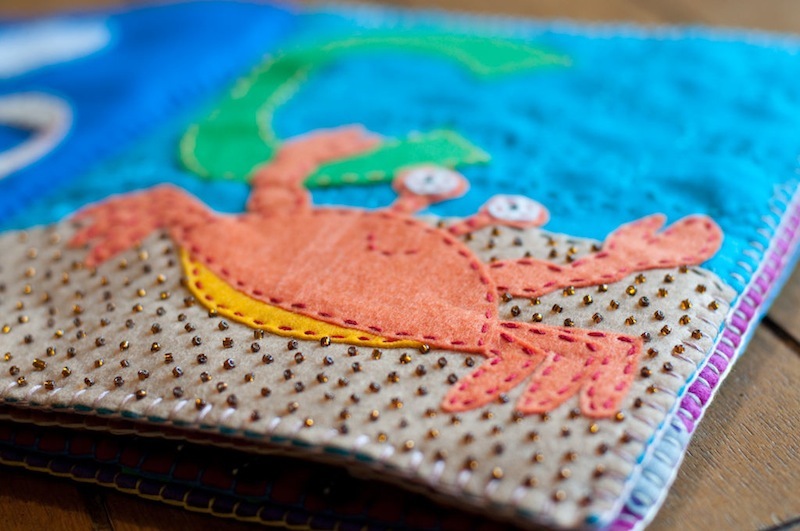 Today's beautiful quiet book comes to us from Nicole of The Malmberg Family. 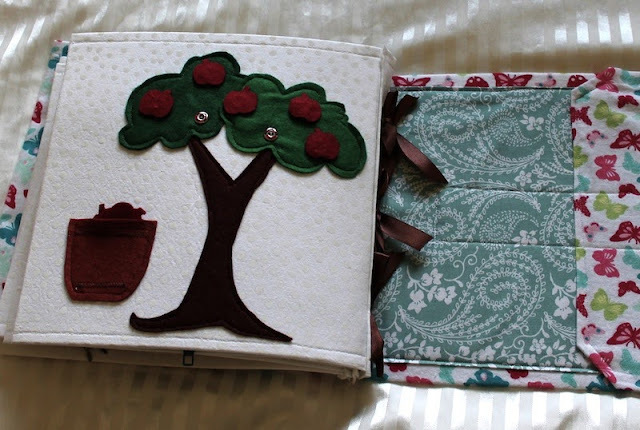 I honestly think this is one of the prettiest quiet books I've seen; the fabric choices for the cover and the page backgrounds are really just lovely and give the book such a nice feel. It really is just so well done and well put together! 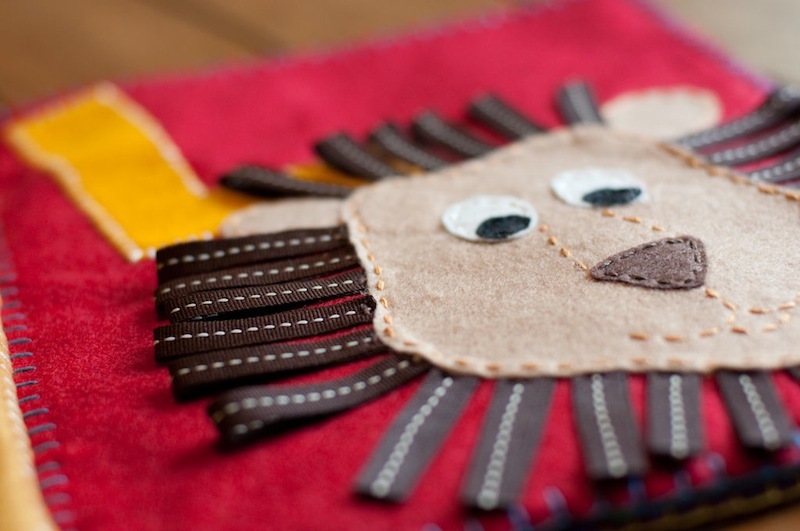 It also looks very fun and I'm sure that any child that plays with this book will enjoy it. Take a look! My daughter Cali who is two-years-old. Beginner. If even that. 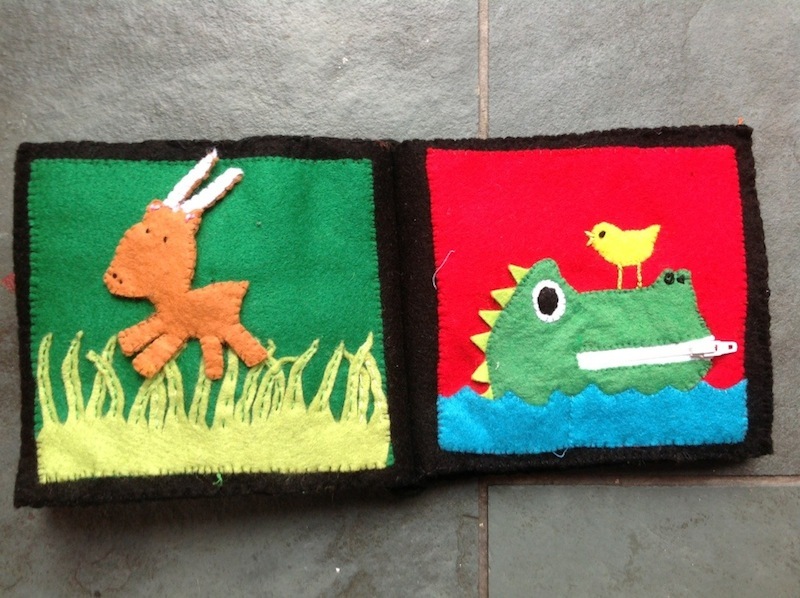 My sewing skills are very mediocre. Started in November 2012, but just kind of did little bits here and there. I really focused and got it finished this past month. It probably took me somewhere around 35+ hours. Finished May 2013. 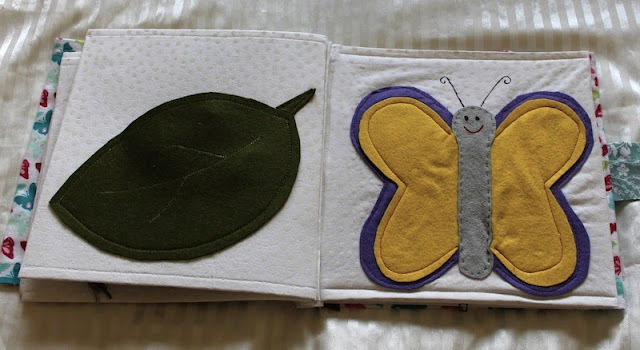 I did use a template for the butterfly/leaf pages and the caterpillar page. 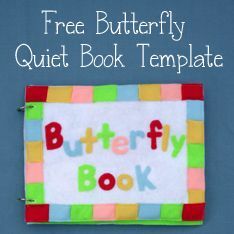 I found the template here: Free Butterfly Book Template. The others I just found on Pinterest and created my own templates. 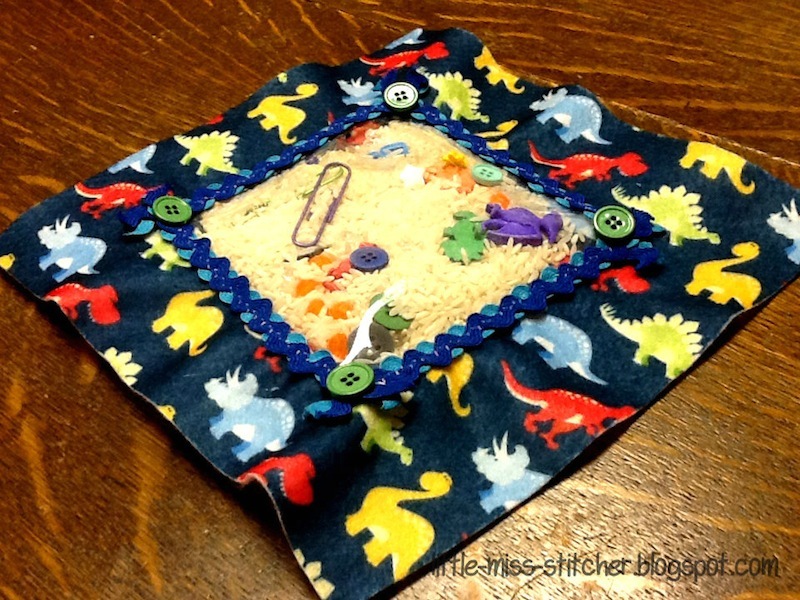 I left 2" room at the left side of each page and made 3 button holes. Then I put ribbon through them and a little panel on the cover and tied them together. you can see the tying done on the last page. Page itself is cotton fabric with some kind of iron on board insert. The pictures are all wool felt. 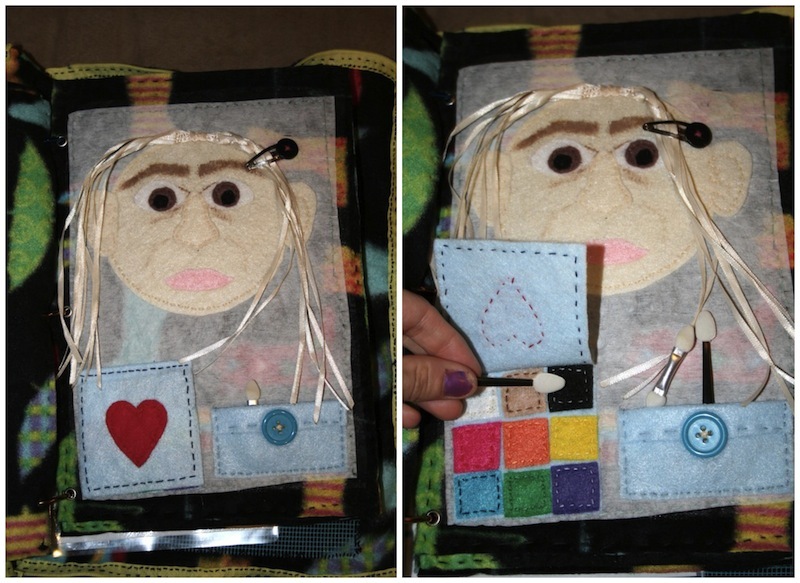 Zipper, Velcro, snaps, ribbon, lock & key, beads, buttons, plastic clip and acrylic paint. TOO MUCH! Since I'm new to sewing I didn't have any previous supplies on hand. I spent close to $100 easily. 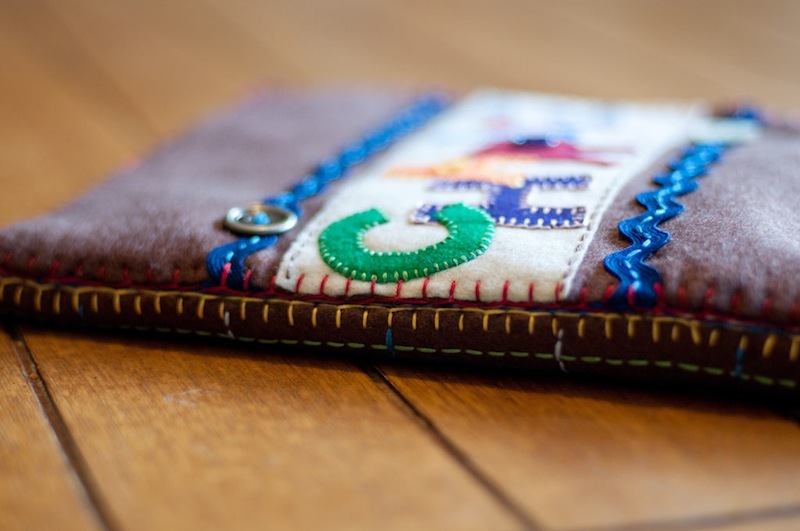 I did borrow color thread from friend. My biggest mistake is buying too much. I have enough supplies left over to make another book and maybe even two! 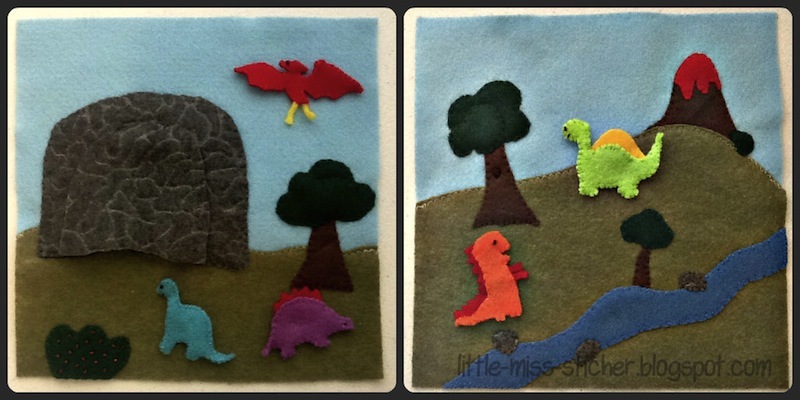 And I ordered wool felt off of Etsy. That was pretty pricey. But I live in a small town and our Walmart felt selection was pitiful. My favorite page is the Tent Page because it was my very first Zipper and I was so nervous to do it. Also, the little diva girl inside the tent is my daughter Cali. :) Also the book cover because my daughter picked out the butterfly fabric which turned out to be so cute. To see Nicole's quiet book on her blog, click here: Cali's Quiet Book. 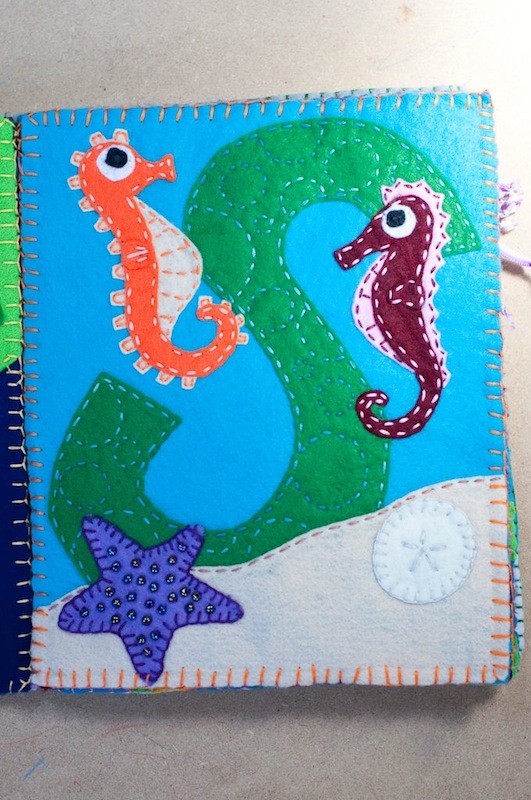 Thank you so much for sharing your beautiful quiet book with us, Nicole! 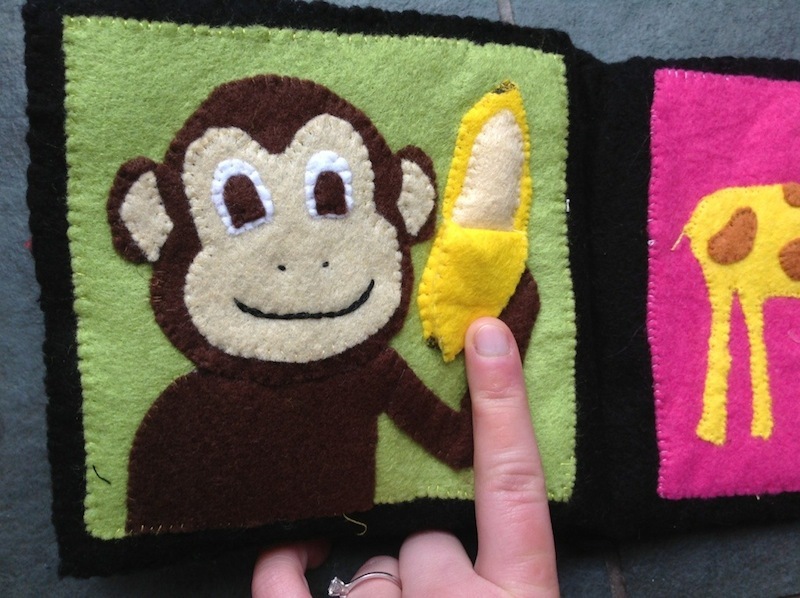 Today's adorable felt baby book comes to us from Hannah of Sunburnt Strawberry. 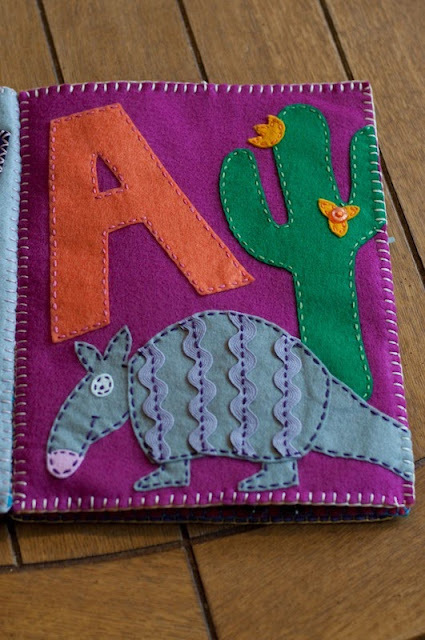 It's kind of a "safari" themed book - each page has a different wild animal to look at and to play with. 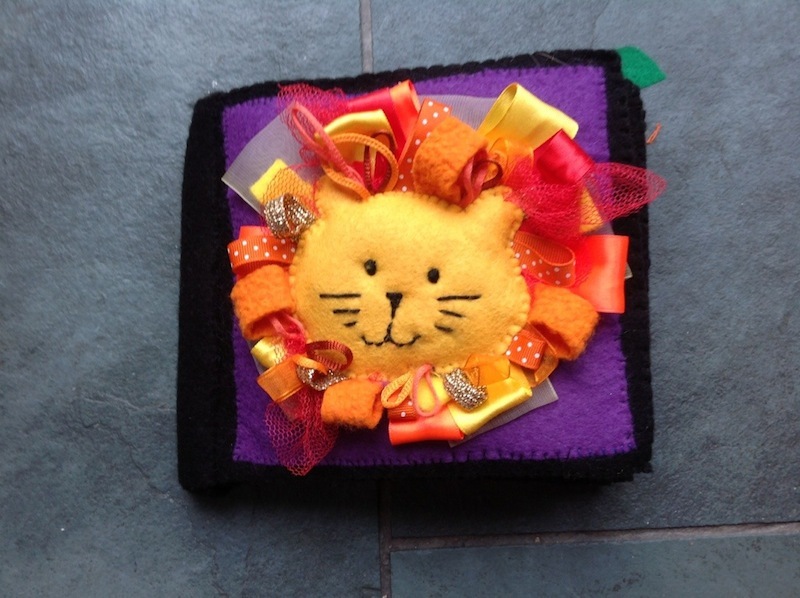 I love the cover - the really cute lion with all the fun ribbons is just so happy and welcoming. 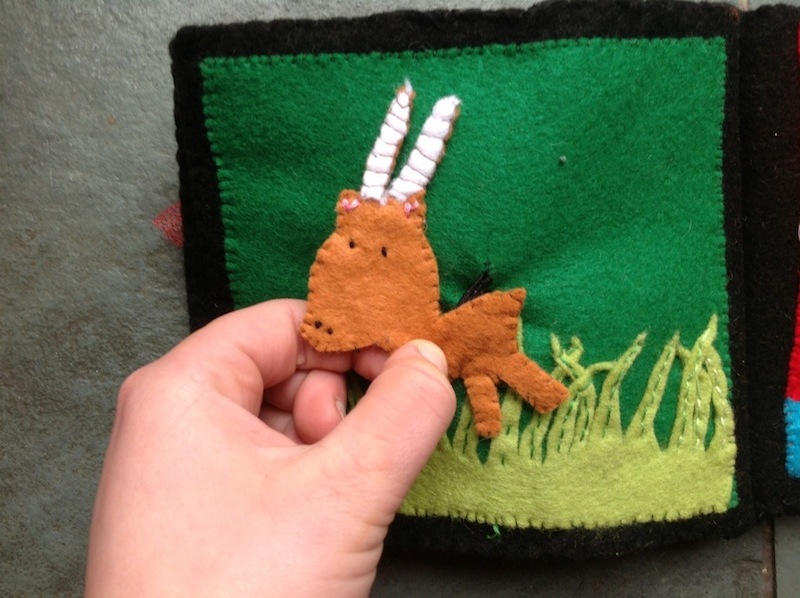 I also really like how the antelope is attached to the page with elastic, so that he can leap across the grasslands. Anyway, each of the pages is so cute and I'm sure you'll enjoy them all! 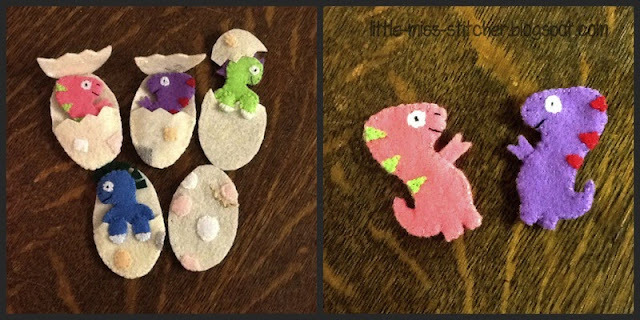 My name is Hannah, I'm a science teacher in my first full year and I find crafty stuff that keeps my hands busy is a great way to de-stress. 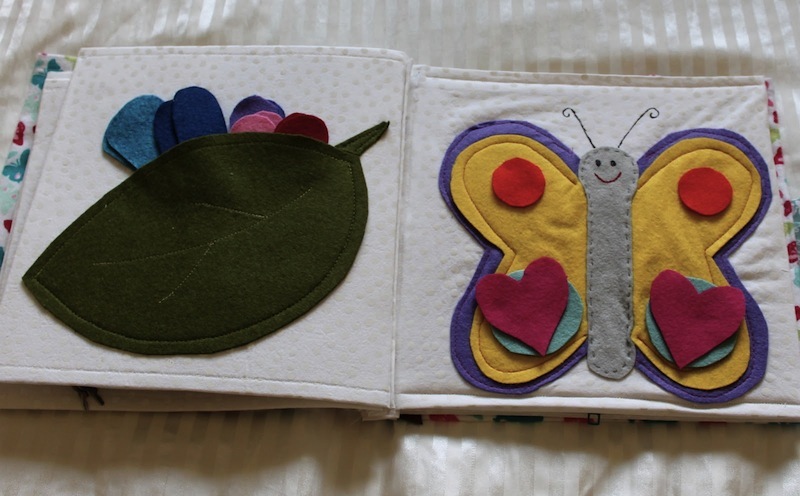 I made this quiet book for my godmother's third baby. He is nearly 3 months old. 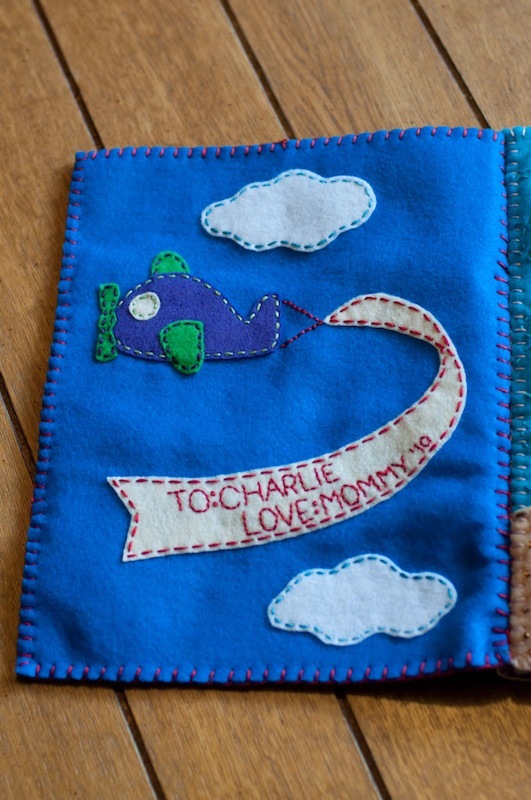 It's something a bit personal for a new baby that she won't have from the first two, and all new babies deserve things made with love. I would say fairly low. 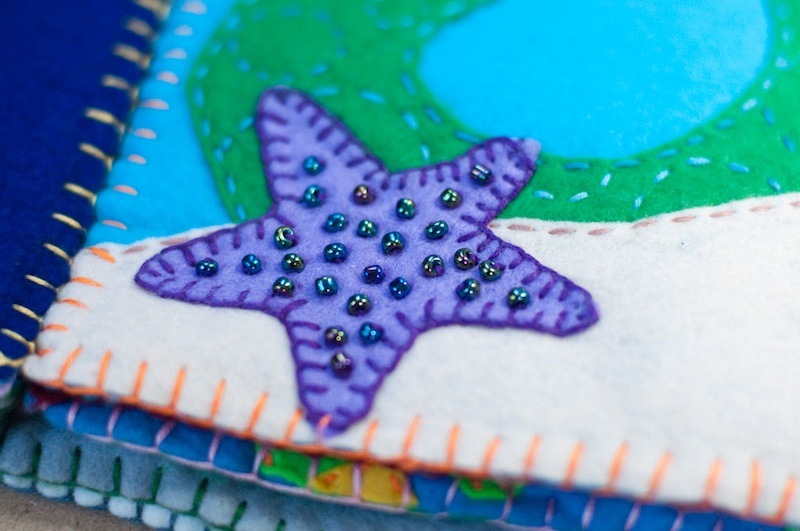 I do a lot of reading pretty thing blogs and wishing I could make the amazing things they do! I tend to make it up as I go along though and all the sewing in this is REALLY simple, just blanket stitch and whip stitch which is about my limit! Errm... Probably about 5 weeks but I only worked on it when I had a bit of free time, maybe 12 hours? But that's just a guess, it mostly occurred while watching TV with a glass of wine! 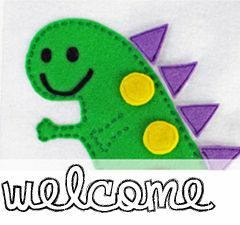 No, I google image searched each animal's name and "clip art" art picked something cute with out twiddly awkward bits. 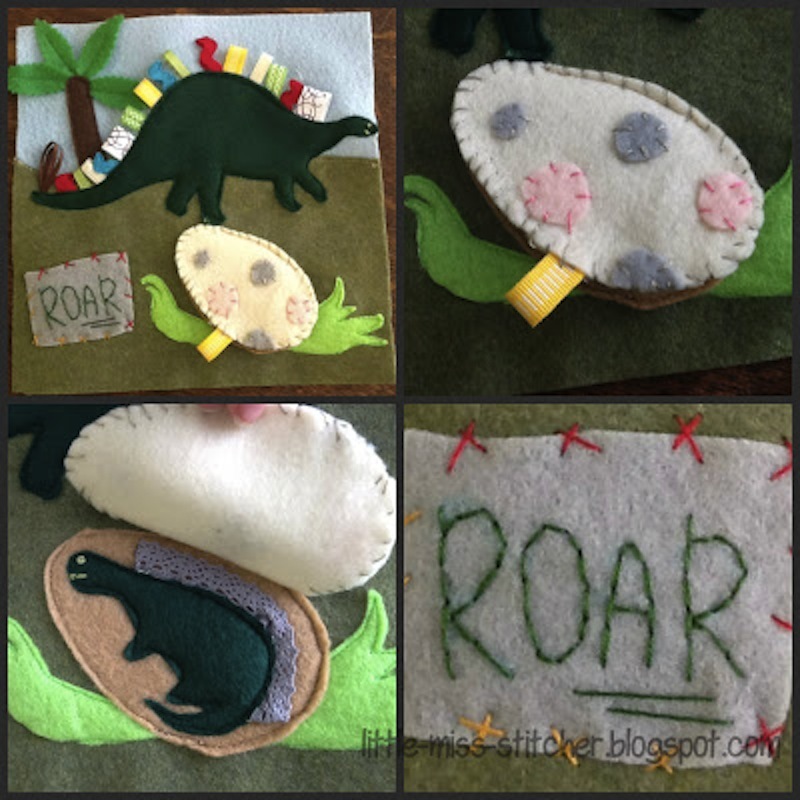 I got inspiration from lots of places including One Lovely Life's felt baby book which gave me the croc, lion and monkey ideas. 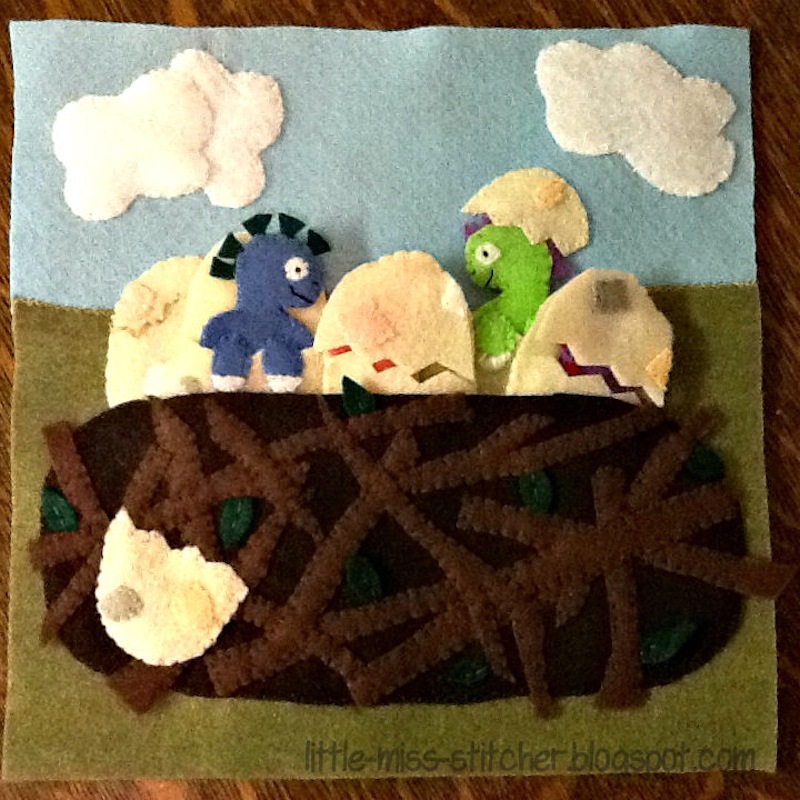 I back stitched through all the layers of felt and then trimmed the excess. 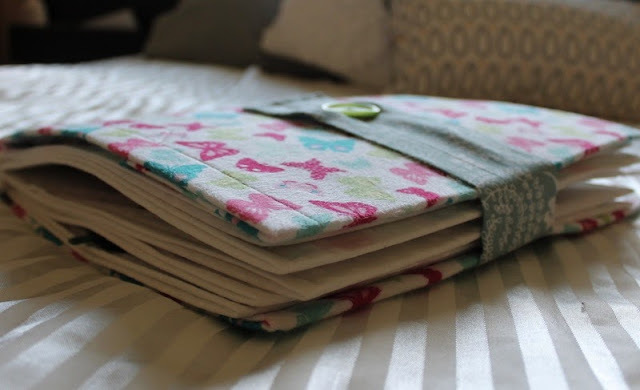 I used two small pieces of scrap to cover the top and bottom of the spine and wrapped the back cover over the spine so everything was nice and smooth and sewed in down at the front. That sounds confusing but hopefully the pictures help! 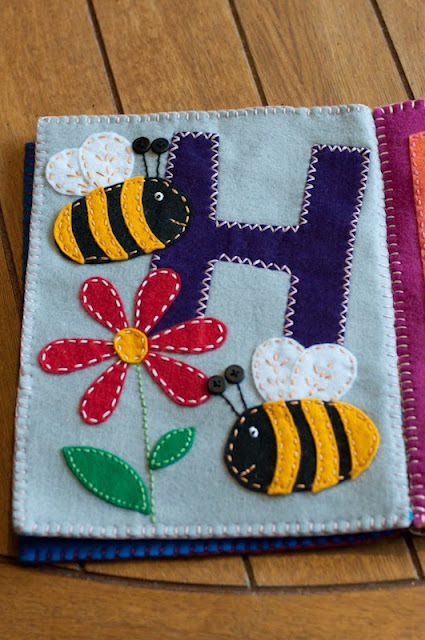 All the pages are made out of half a sheet of craft felt. 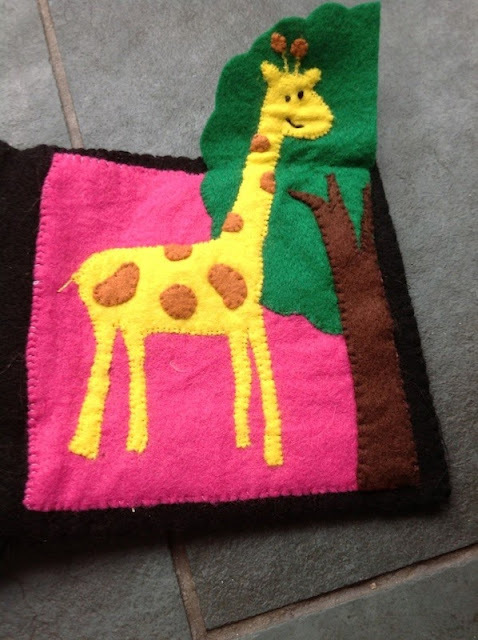 The slightly smaller coloured squares had the animals attached and then they were sewn to the black felt so that it formed a border. I made sure I didn't use the same coloured square twice. Everything is felt because it's so easy to work with. 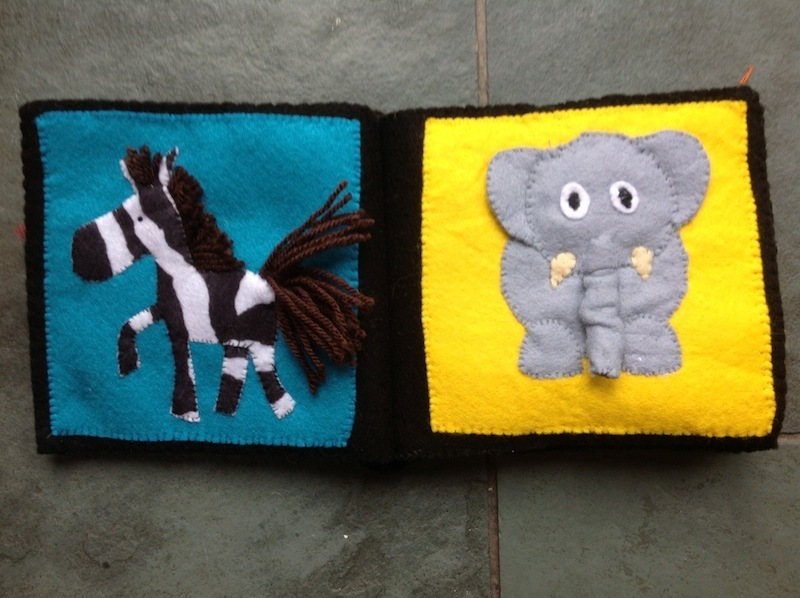 I also used a white zip I already had for the crocodiles teeth, brown wool for the zebras mane and tail, all sorts of scraps of ribbon from my stash for the lion, thread and embroidery floss. 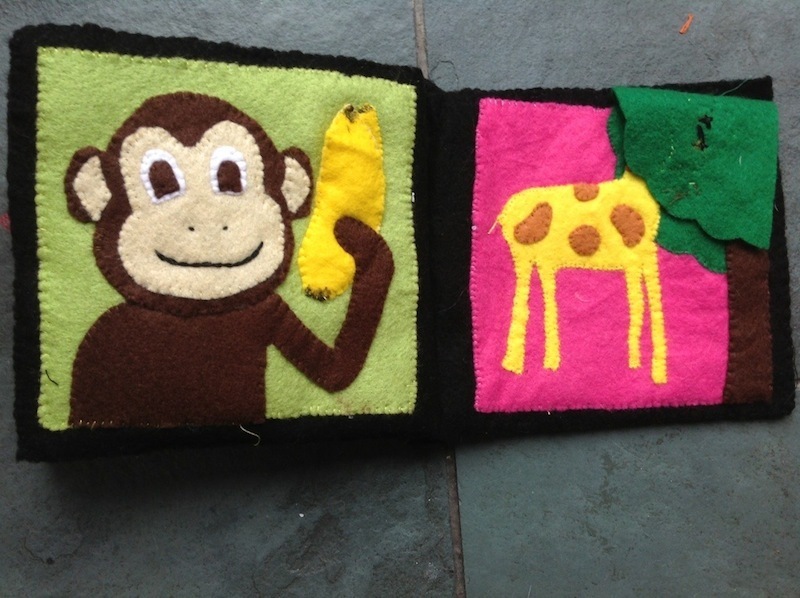 There is a tiny smudge of black fabric paint on the end of the banana. £2.00 for the 4 sheets of black felt and 75p for the zebra felt, everything else I already had. If I had bought the other supplies I reckon it would have come to under £10. I love them all! 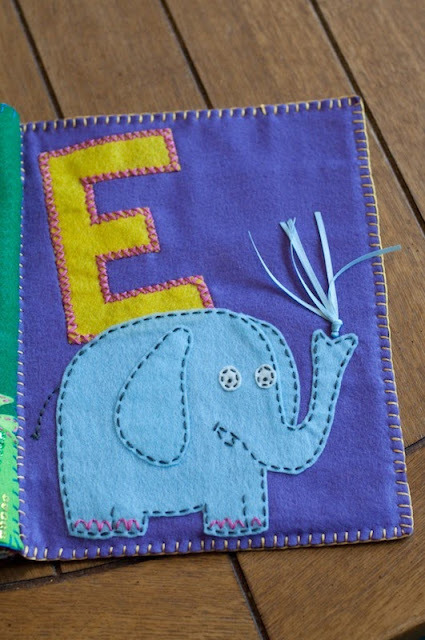 I love the little green fish inside the crocs mouth and the colourful pop of the yellow elephant page next to the blue zebra page. 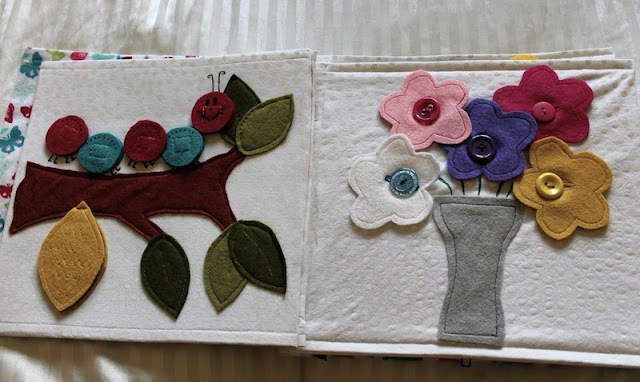 To see more pictures and learn more details of Hannah's baby book, visit the page on her blog here: Sunburnt Strawberry: Felt Baby Book. 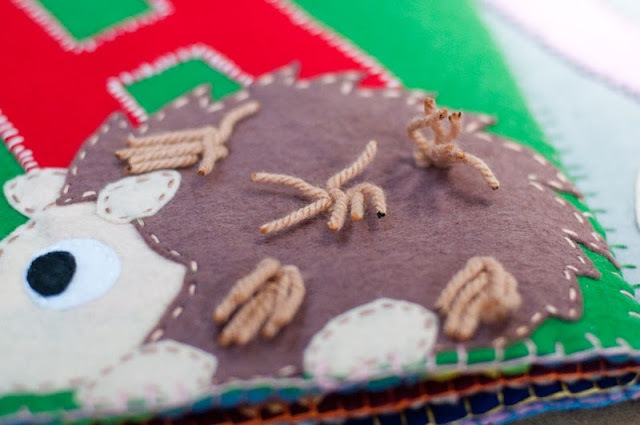 She also has a church quiet book with a post about its construction, so check that out too! 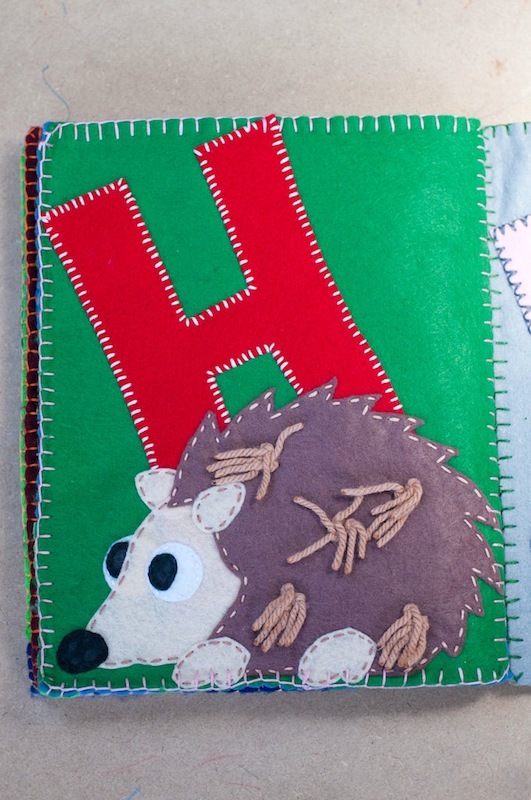 Thank you so much for sharing your adorable quiet book with us, Hannah! Kersten. I am a stay at home wife and mommy who loves to craft and create! 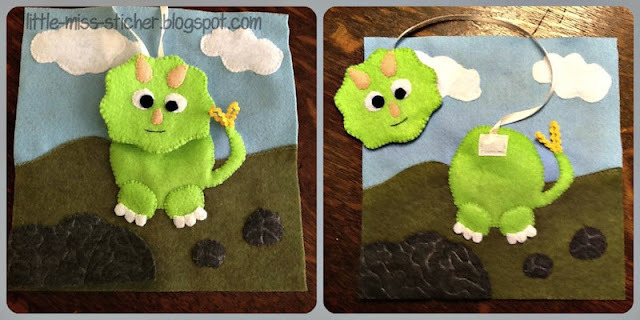 I made it for my son, who is almost a year old. He hasn't played with it yet, but when he's a bit bigger I hope he loves it! HOURS AND HOURS! If it wasn't so fun it would have been ridiculous. I'm not sure how long exactly it took, but anywhere from 4-7 hours per page. I'd rather not figure that out :) That knowledge may ruin the joy quiet booking has brought me! My favorite page is the first one. The one that you can take the dinosaur's head on and off! 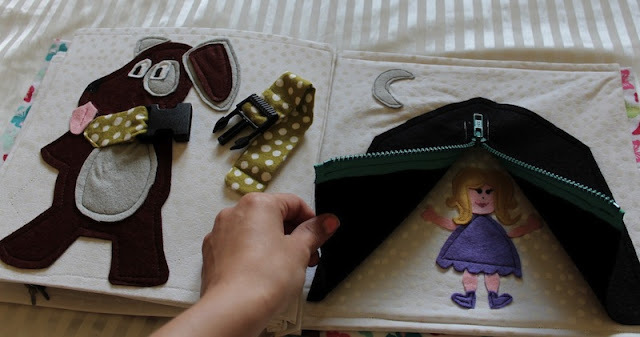 She has another adorable quiet book she just finished, a "Little Sister Quiet Book," that you should definitely check out too! Thank you so much for sharing your awesome quiet book with us, Kersten! 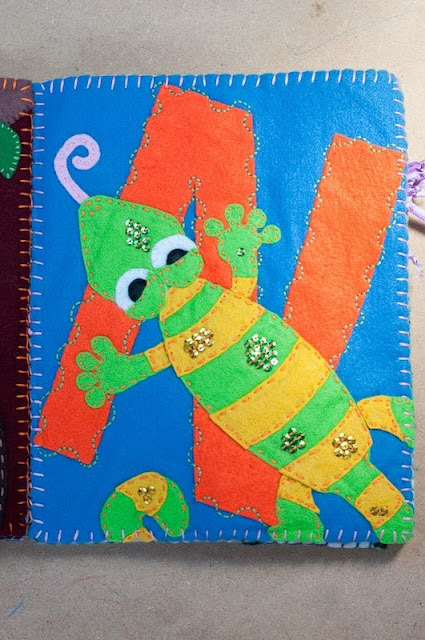 I love quiet books that spell out a child's name on the pages. They're such a cool keepsake - fun to look at and play with when the child is little, and a tender reminder of someone's love for them when they're older. 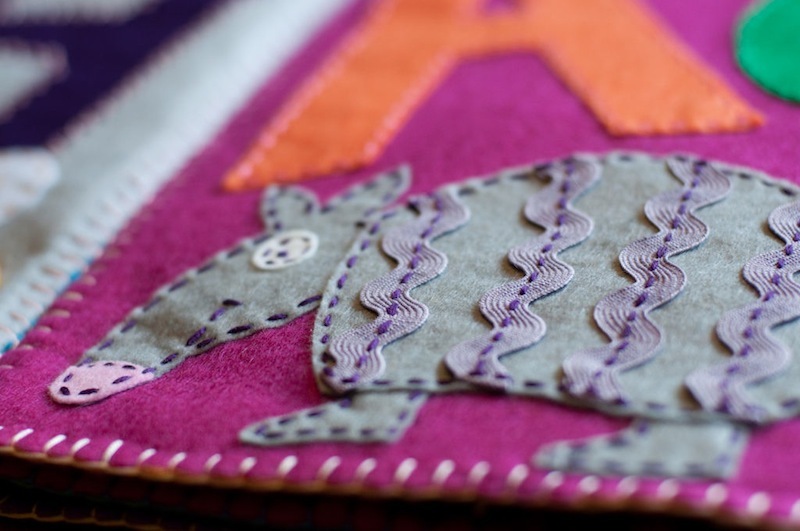 Today's post features two name books made by Kaitlyn of Creatv.ly - and they are stunning. 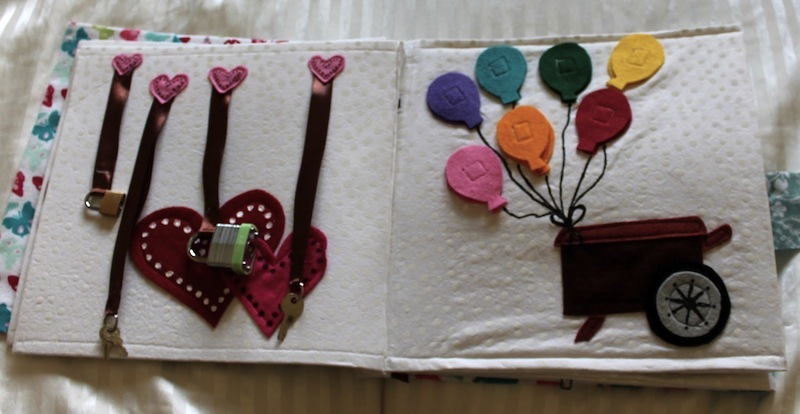 The detail that she put into each page is really just beautiful, and I find myself wishing that I had such talent. 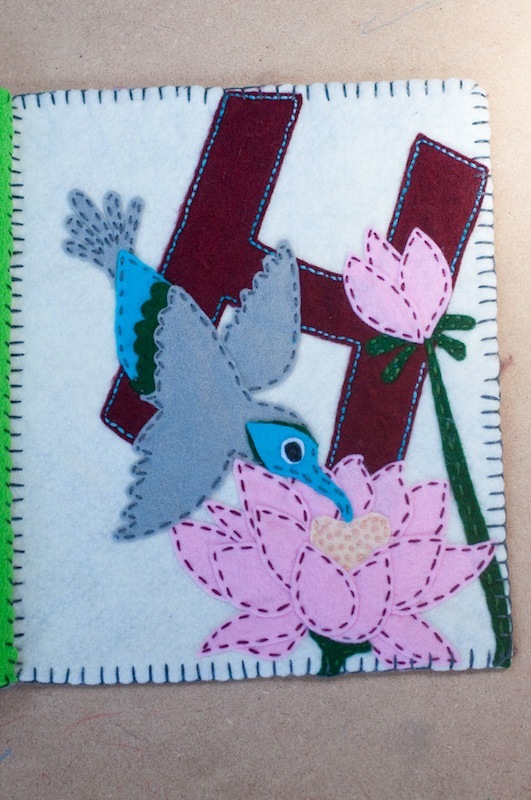 : ) I think my very favorite page from these books is the hummingbird one - I just love the bird and the flower! But it's hard to pick a favorite when there are so many awesome pages here. Enjoy! My name is Kaitlyn. I'm a wife, a mom of two young boys, a photographer, a crafter, a minimalist, and a CrossFit-er. 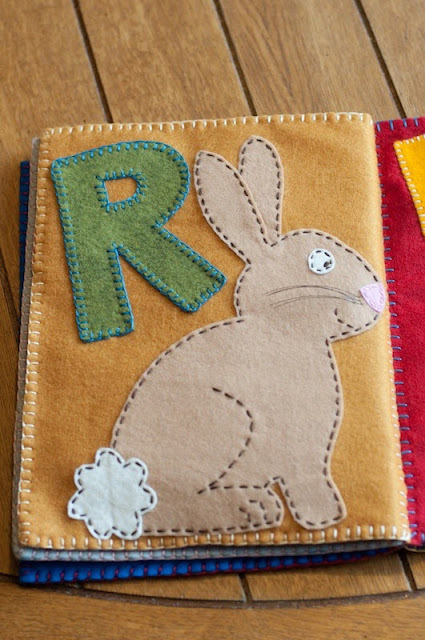 Who did you make these quiet books for? How old are they? I made both felt books during my pregnancies for my two boys. Mason was born July 2008 and Charlie was born September 2010. They still like to look at the books at ages 4-1/2 and 2-1/2. My mom started teaching me how to sew when I was about 8 years old. 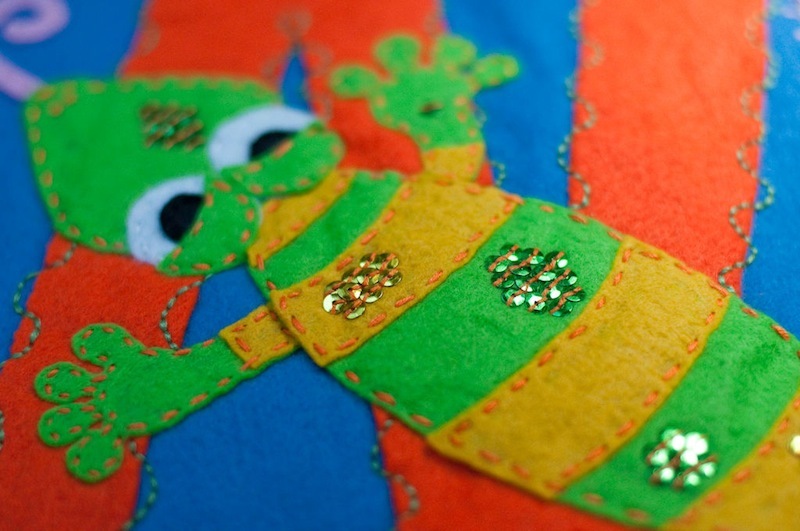 I sewed costumes, dresses and doll cloths throughout my adolescence. 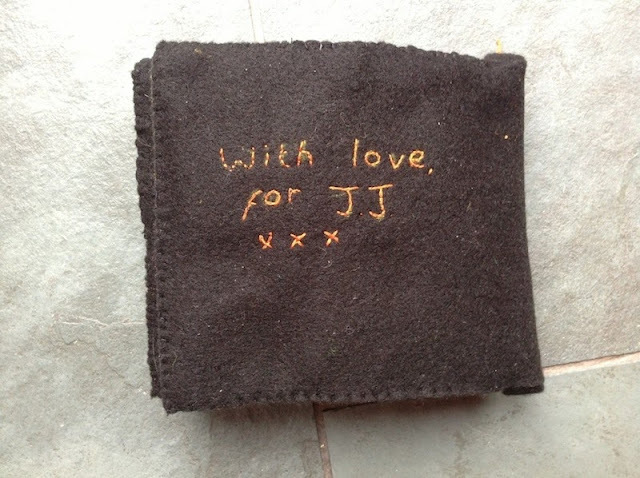 In my late teens I learned how to sew quilt tops. 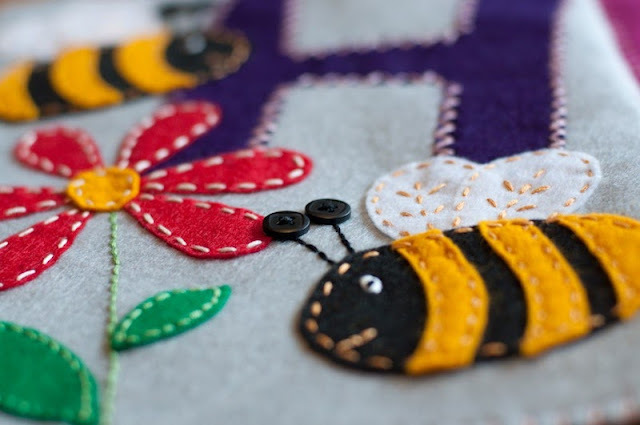 I often use patterns, but I have also been known to make my own patterns as well. I learned how to embroider when I was about 12, but didn't really get into it until later in my teens when I made my first crazy quilt. The fancy embroidery was my favorite part and reminded me of my great-grandmother. 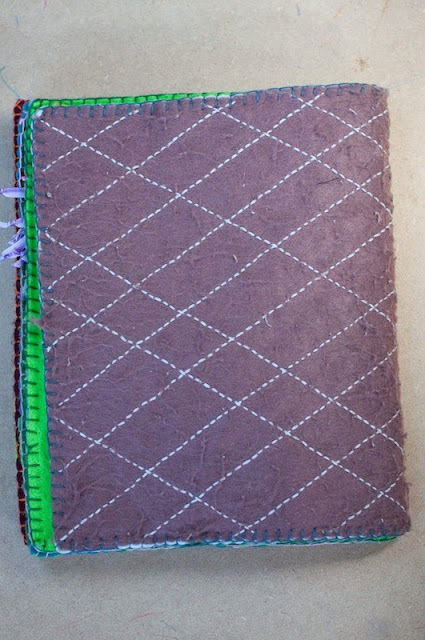 The first quiet book I made took several months to complete. Mostly because I had to take a lot of breaks. I used fabric glue to tack all the felt pieces down before I started embroidering, and later learned that fabric glue plus several layers of felt is almost impossible to hand-stitch through. 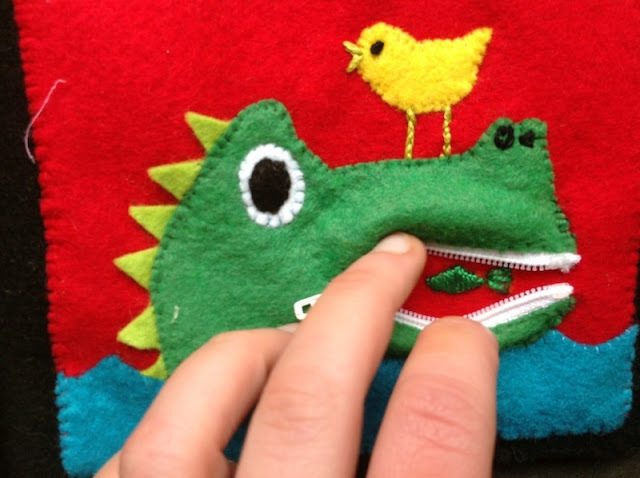 I ended up using a pair of pliers to push and pull the needle through the felt, and bent several needles in the process. It was so difficult to finish, I swore I would never make another one. 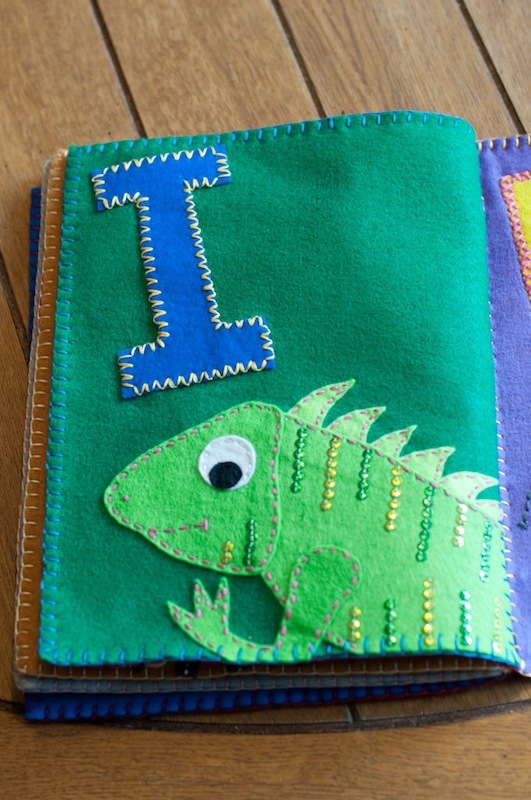 When I found out I was pregnant with my second son, I decided to make another quiet book. 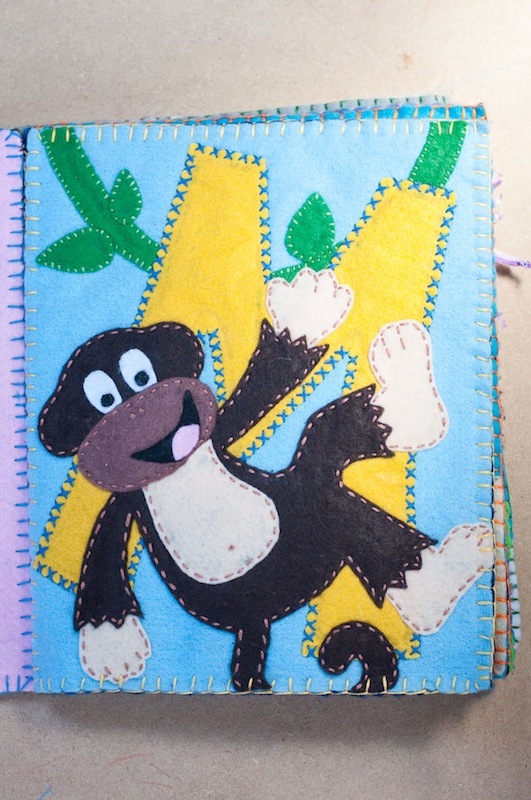 By then I had learned about fusible webbing (aka Wonder-Under), and I was able to work much faster. I completed the whole thing in about two weeks, working on it a few hours each day (mostly during nap time). I made my own templates for both books. I drew my designs out on printer paper, and then cut them up into pattern pieces. 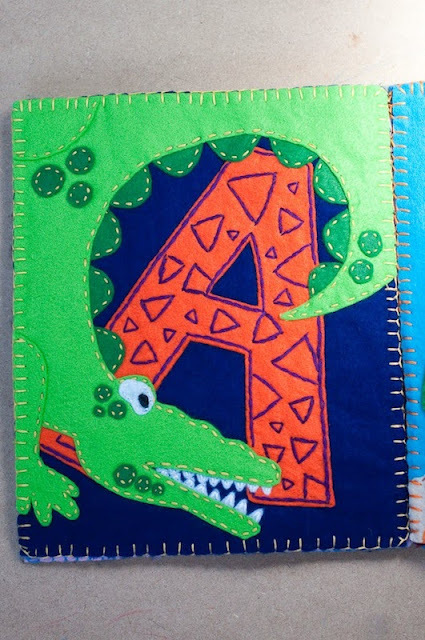 I never had any intention of turning them into actual patterns, but after I finished the second book, I started getting inquiries about my patterns, and eventually I was persuaded to complete the alphabet and turn all my hand drawings into digital patterns. 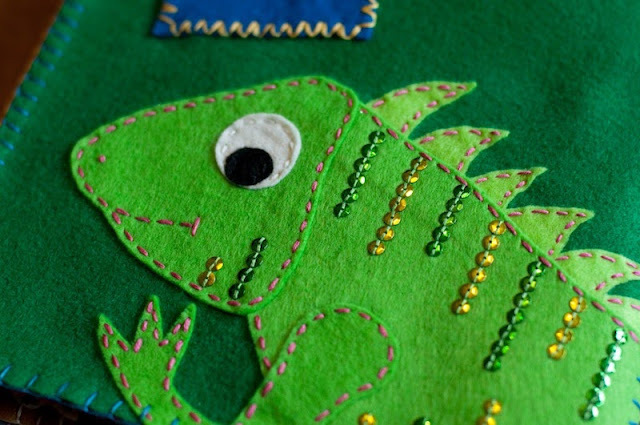 My patterns can now be purchased on my website at http://creatv.ly/shop/. First, I blanket-stitched around the edges of my pages. 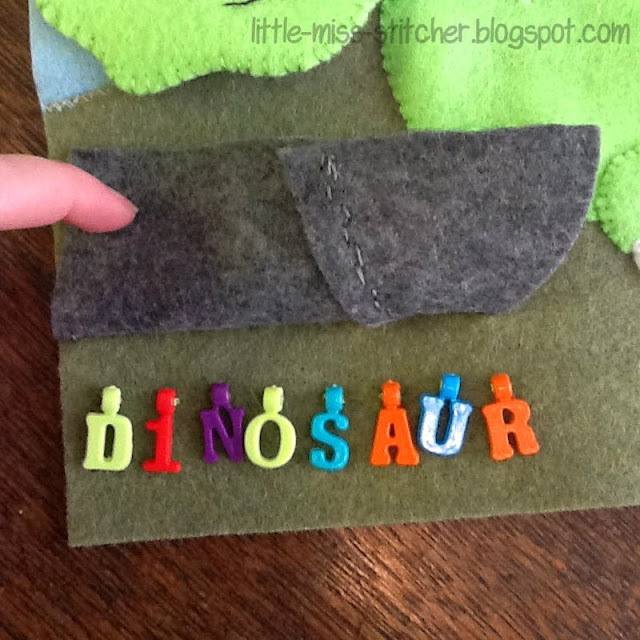 Each page is made up of two single felt sheets placed wrong sides together. 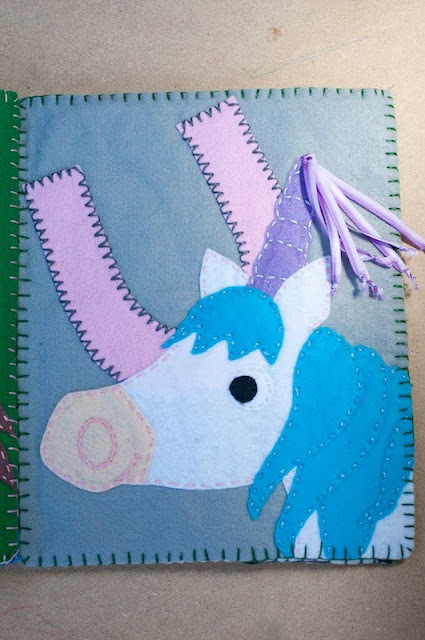 Once all the pages were stitched, then I sewed through the blanket stitching of all the pages on one side to turn it into a book. It's kind of hard to explain in words, so a few years ago I made a video tutorial. 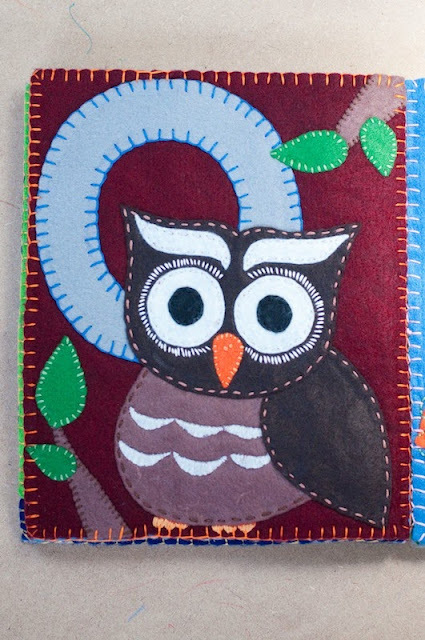 It can be found at http://creatv.ly/felt-book-binding-tutorial/. 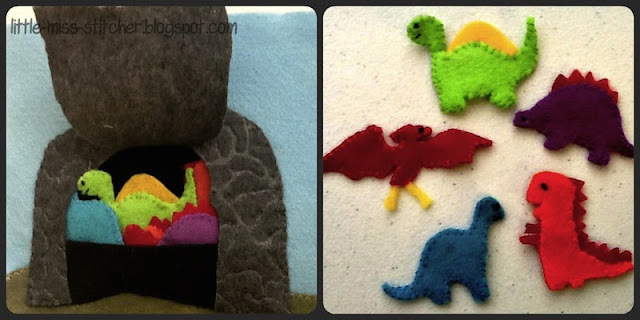 I LOVE felt, and used it for all the pages! 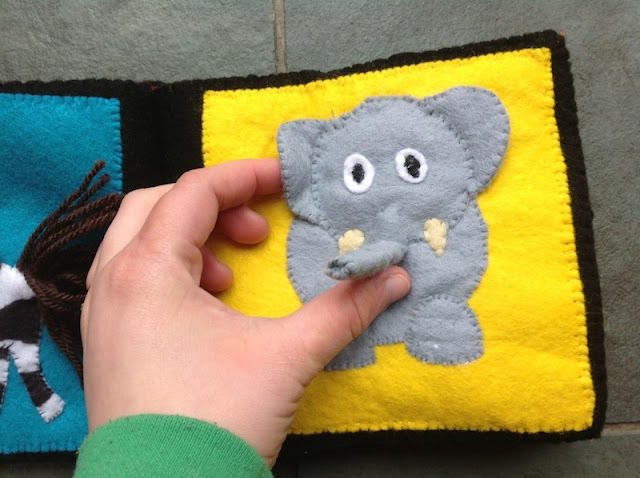 As I mentioned earlier, I started using Wonder-Under to fuse the felt pieces together. I also used cotton embroidery floss for all my stitching; and buttons, beads, yarn, sequins, and ribbon as embellishments. I don't remember the exact cost, but we were poor college students at the time, and I tried really hard not to spend a lot of money on it all. I used the cheap Eco felt you can find in precut sheets at the craft store for 25 cents per page. 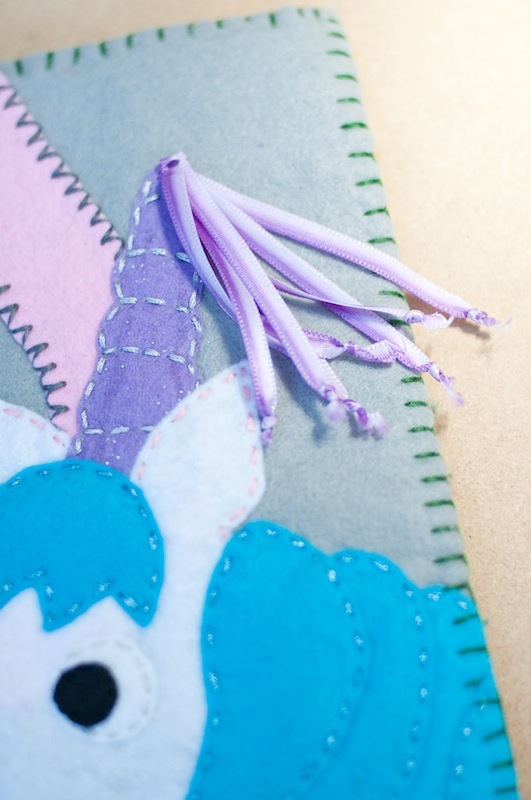 I also had a lot of stuff on hand, but I did have to buy some of the embellishments and embroidery thread. 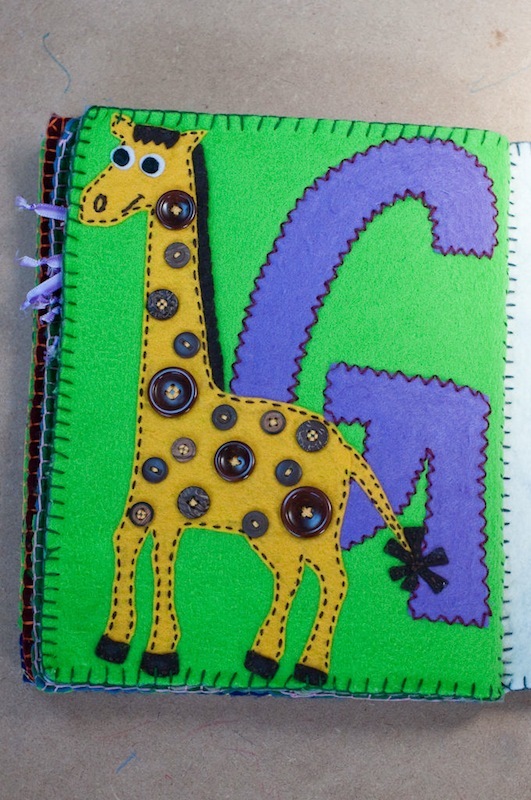 In Mason's book, my favorite page is probably the giraffe. I have a thing for buttons, so it was fun to get to use so many on one page. 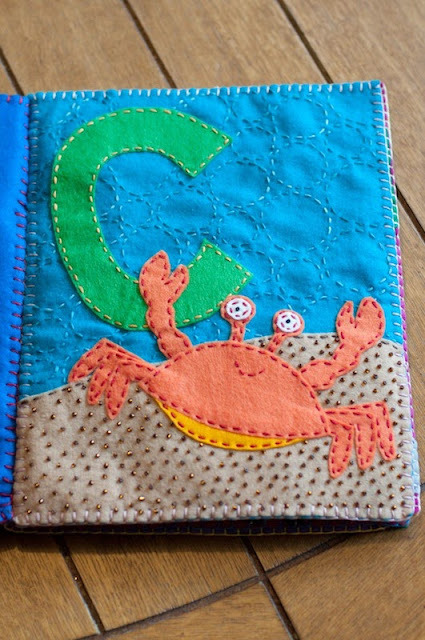 In Charlie's book, my favorite page is definitely the crab. The bubbles and beading on the sand are just so eye catching. 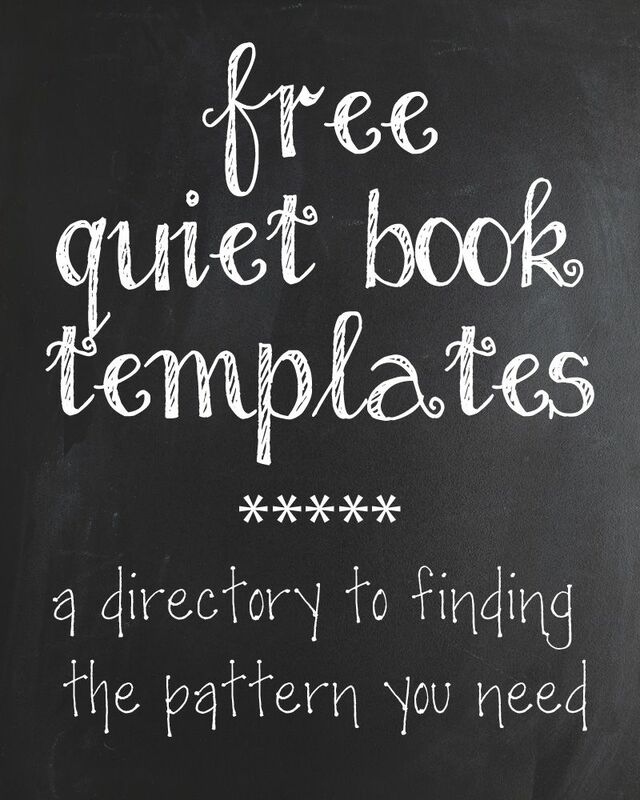 Kaitlyn, thank you so much for sharing your quiet books, templates, and tutorials with us!